Here are some very simple rules, terms and general information about color matching that you can use to ensure you always create the quilt you intended. These tips and ideas can often be applied to other crafts as well, so it is usfeul to know them so you can incorporate them in all your creations. 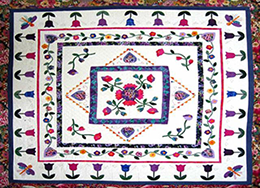 Using only pure primary and secondary colors (no black or white mixed in them) will give you a very vibrant and exciting quilt. Using complementary colors that are the ones opposite on a color wheel will make the colors very distinct and have a truer value. Bleeding is when you use two colors that are next to each other on the color wheel to give the area a soft effect, for example placing red next to orange. Black and white are fantastic colors for a base. Black will dim other colors, whereas white will brighten the same colors in most situations. Both black and white are great to use as “filler” material, runners or sashing. Colorfast materials are an absolute godsend! If you are not sure if your fabric is colorfast test it by dipping a sample in hot water and squeezing it out. If no color (dye) is excreted then it is colorfast. It is always a good idea to wash all your material before you make your quilt in order to prevent problems from occurring later on. Cool colors are soothing and calming, they are generally blues, greens and purples. If you increase the amount of white in cooler colors they can become sombre and sad. Warm colors are exciting and stimulating, they are generally reds, oranges and yellows. These colors will often brighten a room. However, if you are wanting to have the quilt on your bed and the colors are very bright you may be better choosing fabrics with the colors that have been mixed with a bit of white – this will tone them down and making them a little more soothing. Red and green appliqué with a white or cream background are the most common combination from the 1800s. Limited fabric colors made it very difficult to get other combinations until mid 1900s. The introduction of man-made fibers led to a massive change in fabric color schemes. The value of a color is the degree of lightness or darkness. If you add white is called a tint, if you add black it is called a shade. Tone is the lightness or darkness of a color. Monochromatic means many values of one color. Achromatic means without color, i.e. using only neutral colors. Contrasting values occurs when a light color is placed next to a dark color. This can make the light color look bigger. For example, put a yellow circle on a purple or blue background and it will look much bigger than the blue circle on a orange background. This will also work with tone where if you put a shape with a light tone on a dark toned color it will look larger than the opposite. When someone refers to country colors they are speaking about the colors usually inspired by nature’s hues – warm browns, yellow, tree green, sunset red and blue sky’s, purple wildflowers. We would love to hear about any other tips you have! If you have anything to add please email them to us!